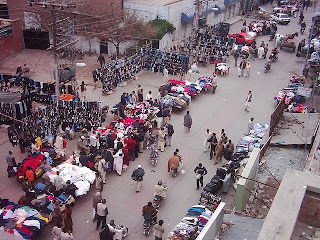 Anarkali bazaar (اناركلى بازار) is a famous bazār (market) in Lahore, Punjab, Pakistan. It is one of the oldest surviving markets in South Asia, dating back at least 200 years. It is located on the Mall Road at 31°34'0N 74°18'58E with an altitude of 210 metres (692 feet). The market derives its name from a nearby mausoleum thought to be that of a slave girl named Anārkalī, buried alive by order of the Mughal Emperor Akbar for having an illicit relationship with the Emperor's son, Prince Salīm, later to become Emperor Jahāngīr. Anarkali Bazar is the oldest bazaar of Lahore, Pakistan, yet it has coped with the changing times by introducing new trends in business. Today it can be considered as one of the best business centres of Pakistan. Anarkali Bazar is divided into two portions, the Old Anarkali Bazar and the New Anarkali Bazar. The Old Anarkali Bazar is famous for traditional food items while the New Anarakli Bazar is famous for its traditional handicraft and embroidery cloths. Babar Handicraft and Gift Centre is the oldest shop located at 110 New Anarkali. It is famous for its quality of hand made products. The mausoleum of Sultan Qutb-ud-din Aybak of Mamluk Sultanate is also located at Anarkali Bazaar. In the early 1970's, mausoleum was renovated at the orders of the then Prime Minister Zulfiqar Ali Bhutto.